With Christmas and a new year just around the corner, it seems a good time to remind readers of some of the key facts about Australian meat chickens, including what they look like and how they are reared. Since this is about the chickens themselves, I’m going to focus on four key facts…the ones that in visual depictions and in words meat chickens are most often misrepresented. How often do you see news articles or other stories about the Australian chicken industry with images depicting red or brown coloured chickens (often in cages as well, another sign that they’ve got the wrong bird; more on that later). Well, guess what? Those red or brown birds are almost certainly egg laying hens, not meat chickens. Current Australian meat chicken strains are almost exclusively white feathered – at least they are after they shed their fluffy yellow baby down, a process which starts from about a week of age. Why are they white? Well, partly it’s to do with the original breeds that were selected to be crossed to create a heavier, meatier chicken hybrid strain specifically for meat production. These efforts commenced in the 1950s when white Plymouth Rock chickens were crossed with white Cornish chickens to produce the original hybrid meat chicken strains. However, white feathering has, in itself, been seen as a desirable characteristic for a meat chicken (and has generally been preferentially selected for over the years) because it results in a more visually appealing carcass. As it is almost impossible to remove 100% of pin feathers from all birds during processing, and because coloured feathers contrast so much with the skin colour, they are undesirable from a customer appeal perspective. It’s worth noting that it’s conceivable that different coloured breeds of meat chicken may be adopted in Australia in the future, but for now, pretty much all meat chickens in Australia are white. In appearance, today’s meat chickens also look ‘chunkier’ than egg laying chickens as they have been bred, using conventional genetic selection techniques, to carry more meat. For more information about the breeds used by the two industries see my earlier blog: meat chickens vs laying chickens. Both male and female chickens are used to produce chicken meat, as is the case right around the world. Unlike the case for the egg industry, where only hens are required to lay the eggs that are sold for human consumption, both male and female meat chickens can be, and are grown for meat and are equally valued by the chicken meat industry. 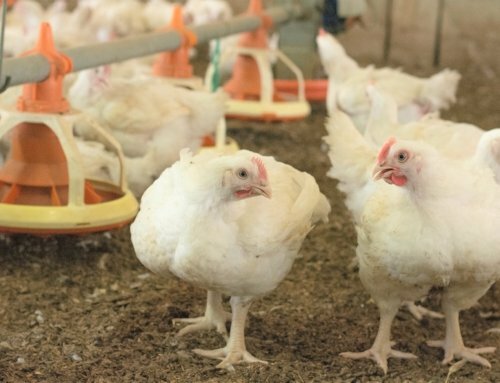 More information on the differences between male and female meat chickens in terms of how they look or how they grow can be found in a previous blog: Are meat chickens male or female? 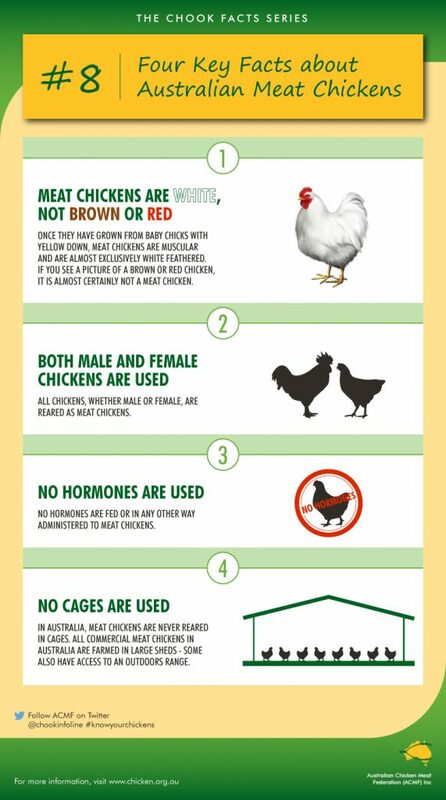 How many times have you heard people talk about hormones in chicken meat? …that hormones are ‘fed’ to chickens? … that the hormones in chicken meat are causing an epidemic of early maturity/puberty in our young kids today? Well, guess what? All the above are simply UNTRUE! 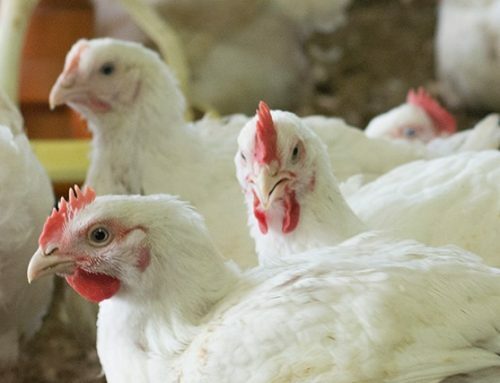 The origin of the “hormones in chicken” myth, and why they are neither used or useful in chicken production are explained in the blog: The Hormone Myth. Australian meat chickens are grown on the floor of large sheds or barns. The floor of the barn will always be covered with a bedding material (the industry calls this bedding ‘litter’), which comprises some form of absorbent material, for example wood shavings, rice hulls or chopped straw. 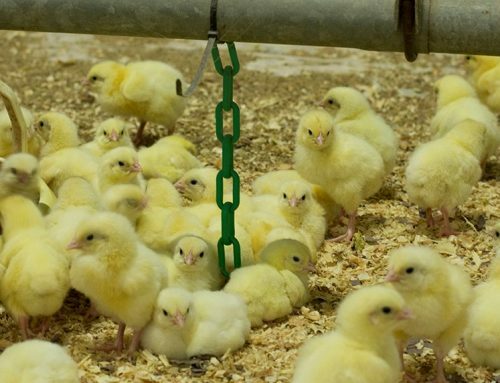 If you would like to get an idea of what an Australian chicken farm looks like, there are plenty of photos on the ACMF website of both the exterior and inside a typical chicken shed (see http://www.chicken.org.au/page.php?id=200&gallery=Broiler%20Farm for some examples). What about the photos you see in the media and elsewhere of chickens confined to cages? They are photos of egg laying chickens. Cages are often used in the egg industry. 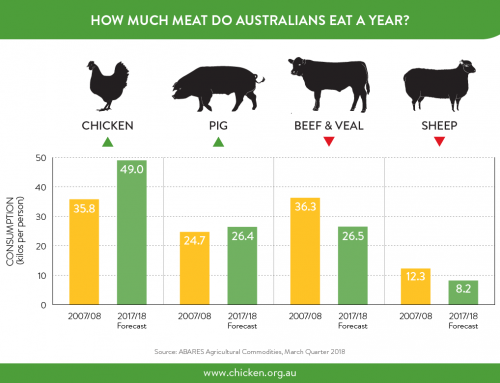 For more explanation of how Australian meat chickens are housed, have a look at this earlier blog: Meat chickens and cages? Thanks for your interest in my blog this year and for sharing it with your online communities. Wishing all my blog readers and their loved ones a safe and happy Christmas. Chook Chat will return in February 2017.